Valentine's Day is all about Love, Red Heart, Red Flowers and Red Lips! 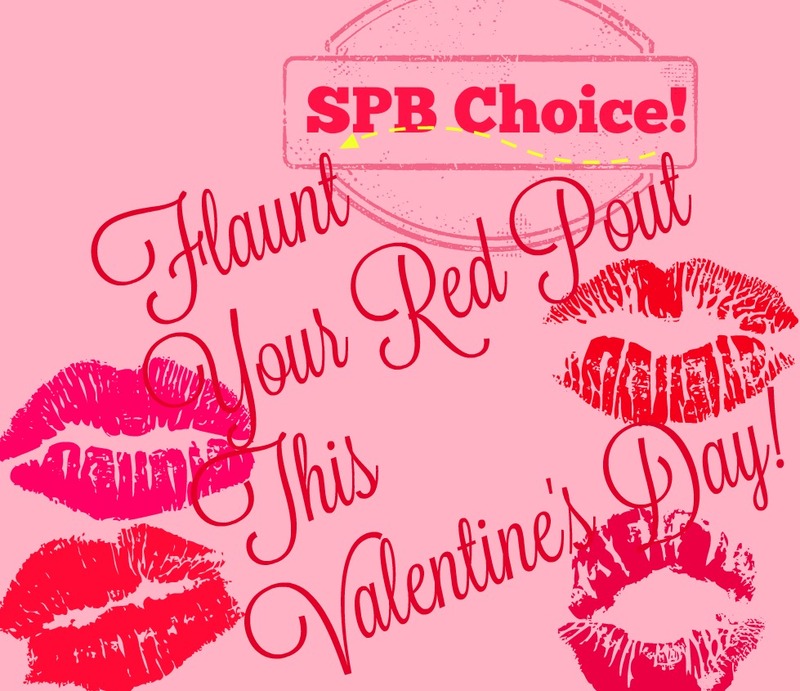 So here is #SPBChoice for attaining the best Red Pout on this special day. Here is #SPBChoice for Red Pout this Valentine's Day with swatches and a brief quick review. 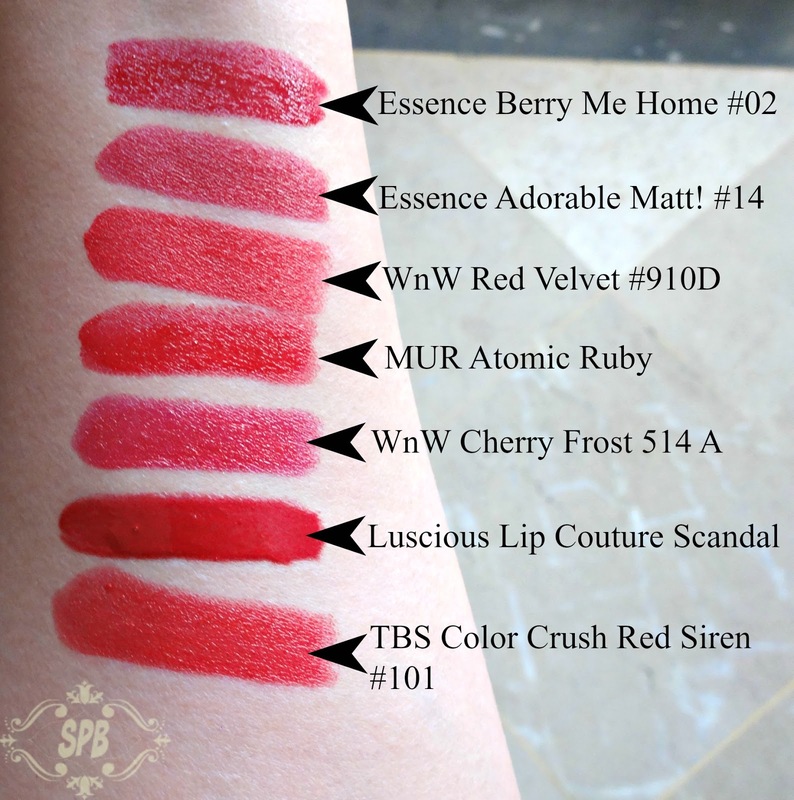 L2R: TBS #101, Luscious Scandal, WnW Cherry Frost, MUR Atomic Ruby, WnW Red Velvet, Essence Adorable Matt, Essence Berry Me Home. 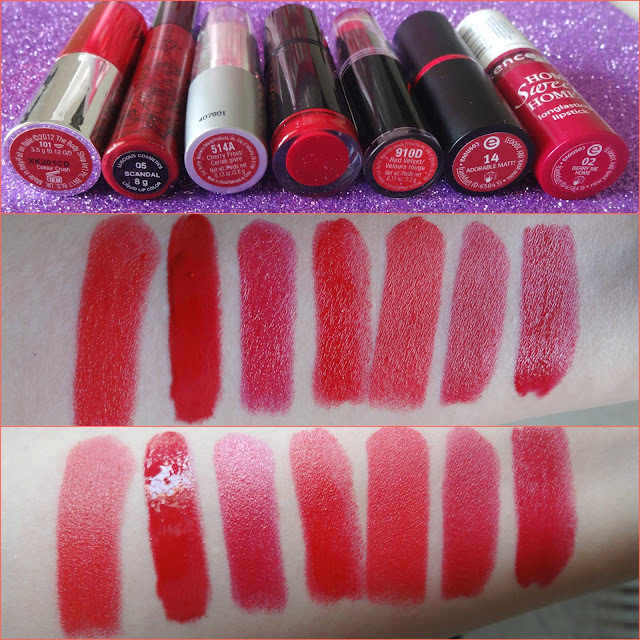 Note: Lip products placed Left to Right in above picture are swatched Bottom to Top in the following picture. I love this Red. Its my all time favourite RED Lipstick. Its a pure Red, on a bit warmer side of the shade, but still pure as blood. Staying power of this lipstick is great rather phenomenal. Texture is creamy-sheen and its very pigmented. Doesn't feather or bleed. Winner for me! If you are into Glossy lipsticks then this Lip Couture is for you. Pure Red again, its bright but not on-your-face kinda bright. Best for brides-to-be. The best part is that it is a good-behaving gloss, it won't bleed or feather and pretty much stays where you apply it. This RED depicts LOVE and I like it! Note: This is the older version of #LipCouture. Here is a pick for sheen/metallic finish lovers. Its Cherry red, disillusioning pinkish RED, with a decent sheen finish. It does feather, but that can be handled with applying a matt lip liner and all that concealing tricks, if you know what I mean. An affordable brand and a good Red shade. It is a warm red. Creamy finish. No, no its not dupe of Ruby Woo. I like it though. Matte/semi-matte lipsticks are your thing? Then this is your new baby! A pure Red, with neutral undertones gives a perfect pigmented semi-matt finish. Yes it not THAT MATTE, but I like it that way. The only bad habit of this baby is, that it bleeds, and bleeds a lot, that can be managed, only if you have ample time of creating barriers around your lips. The shade is love though, wish it behave nicely. A Red with depth, kinda dull maroon red. Texture is semi-matte, it has no sheen but it ain't matte either. Staying power is fine. Doesn't feather or bleed. So its a Keeper! Sheen finish bright Red. It has berry tones. Not that pigmented, need more than one swipes to get you the desired shade. Staying power is not satisfactory. Prone to feathering and transferring. Hope you like our picks for your Valentine's Day. 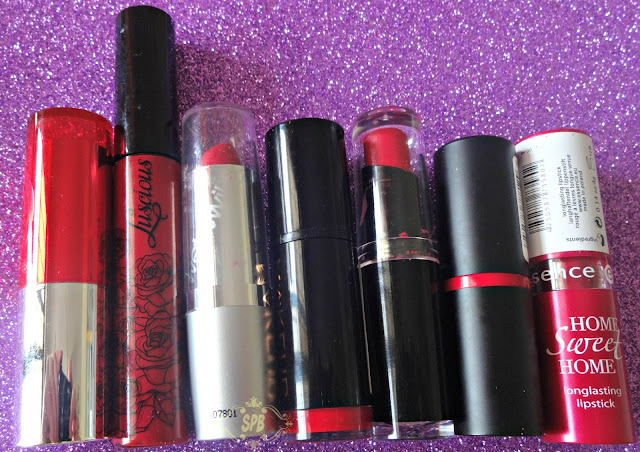 Do comment and let us know "Which Red Lipstick you love the most? 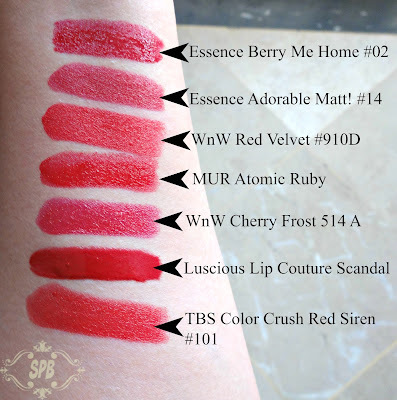 Follow #SPB and #SPBlovesREDLips on Instagram, Facebook and Twitter. Love love love the richness of the post! Although i am not a red lipstick person still i love them! Essence Adorable Matte looks lovely! You have an amazing collection of reds my friend. My fav among these would be TBS Red Siren. Its gorgeous. Luscious lip couture in Scandal looks good!